I hope everyone is enjoying #CookoutWeek 2017 and finding tons of amazing recipes for your summer cookouts and picnics! Don't forget to enter to win our awesome giveaways for your summer cookout needs and more. Today, I'm sharing an over-the-top bean recipe for your next cookout. It's over-the-top because it contains not only four different types of beans*, but also beef and bacon. These beans are a hearty, sweet, stick-to-your-ribs side dish that feeds a crowd and is always a win! 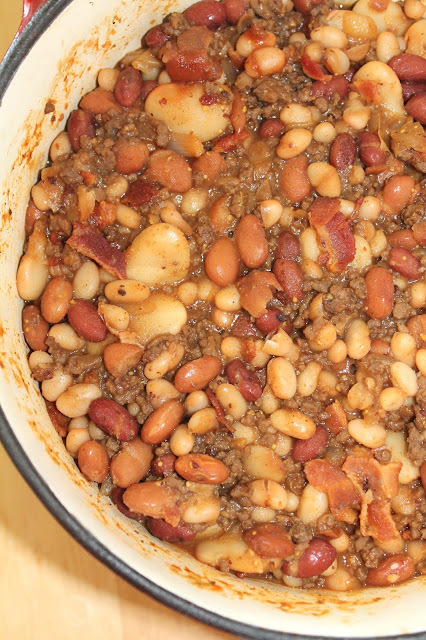 There are a lot of different versions of these types of bean dishes with many different names, but I like the name cowboy beans as they remind me of something one would eat while sitting around a campfire. They go perfectly with barbeque chicken, burgers, hot dogs (pro-tip: spoon some on top of your hot dog with a bit of mustard), and more! #CookoutWeek is here and I'm super excited to be participating with so many amazing bloggers. Grilling, cookouts, picnics, and eating outside are all quintessential summer activities. I can't wait to see all the terrific recipes everyone shares this week. 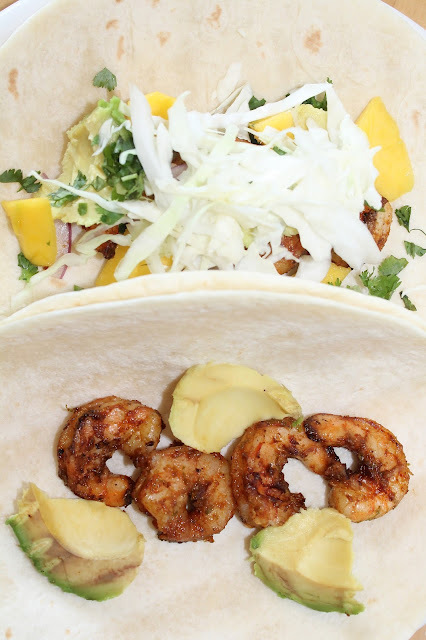 First up, I'm sharing these Smoked Shrimp & Avocado Tacos made with the help of Smokin' O's. My husband is the grill master here, so he helped me with this recipe and we were both really looking forward to trying these out. We don't have a smoker, but we do enjoy smoke flavor, so this was a perfect product for us. We used the Applewood Smokin' O's for these tacos and they turned out amazing!! The smoke flavor was prominent, but not at all overpowering. I wasn't sure if the smoke flavor would penetrate the shrimp since they don't cook for too long, but they were perfect! The Smokin' O's were so simple to use and we will be using them a lot! We already have more ideas, so be on the look-out for those. Tacos are a year-round staple for us and I love that we can make them on the grill now, too! This taco recipe will serve two people. It's perfect for a weeknight cookout for two, or it's super simple to double or even triple! Check out my video of a Smokin' O in action on the grill while making this recipe! 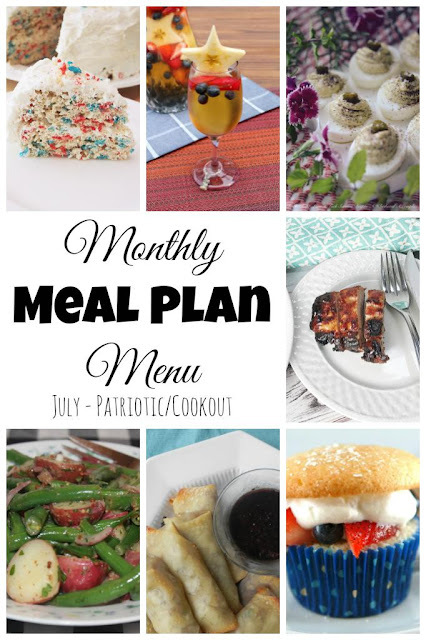 It's time for July's meal plan menu which consists of recipes that are patriotic and/or cookout appropriate for the July 4th holiday, or any summer picnics you have coming up. Please check out all the recipes below. Happy Friday, everyone! Since it's Friday, that means it's Friday Frenzy time! Please check out our favorite link-ups from last week and share what you've been doing this week! I've missed a couple of months of the Fantastical Food Fight recently, but I'm back this month to join in the Peaches & Cream food fight! As soon as I saw the theme, I knew I wanted to go savory with my recipe. We have a lot of pork in our freezer (which we just cleaned and re-organized) from our half pig, so while thinking about what to make, this dish sprung to mind. I wasn't completely sure it would come out good, to be honest..... But, it came out even better than I thought! Both my husband and I enjoyed it a lot. 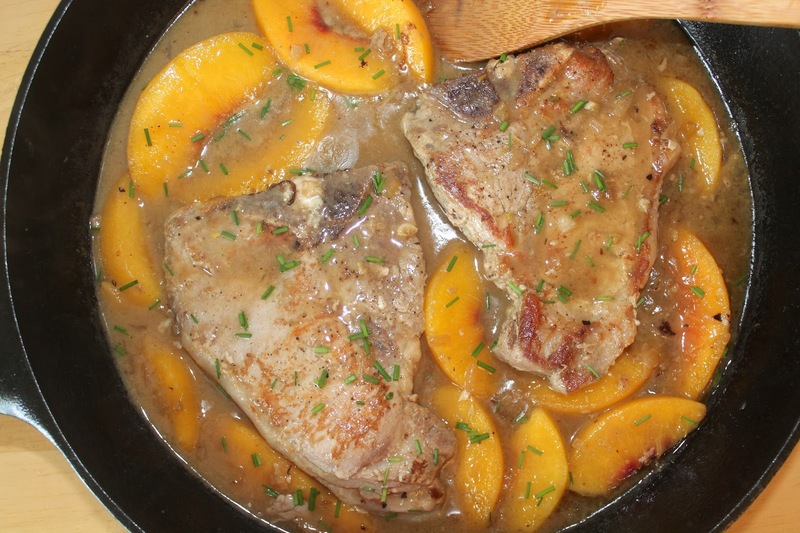 I made this dish with just two pork chops as our twins are not quite up to pork chop level yet; however, you can easily add two more to your skillet along with more peaches. There will be plenty of sauce. I served these with a side of couscous and peas. I'm excited to be joining the Friday Frenzy link party! You will be finding this post on my blog every Friday now along with all these other amazing bloggers pictured above. If you are a fellow blogger, please link up a favorite post (or two) below. Enjoy your weekend, everyone! I have one more post right now in the baby/toddler food series and then I'll be back to some more of my regular food recipes (for a little while at least). I swear! I feel like I'm learning to cook all over again lately. Since our twins are starting to like more table and finger foods, I try to come up meals that all of us can eat when my husband is home for dinner. That can be challenging still though, but they have been eating small pastas, soft vegetables, eggs, salmon, potatoes, meatballs, and other things like that. They still eat chunkier purees, especially for breakfast and lunch (and they still love Greek yogurt and cereal, especially barley). 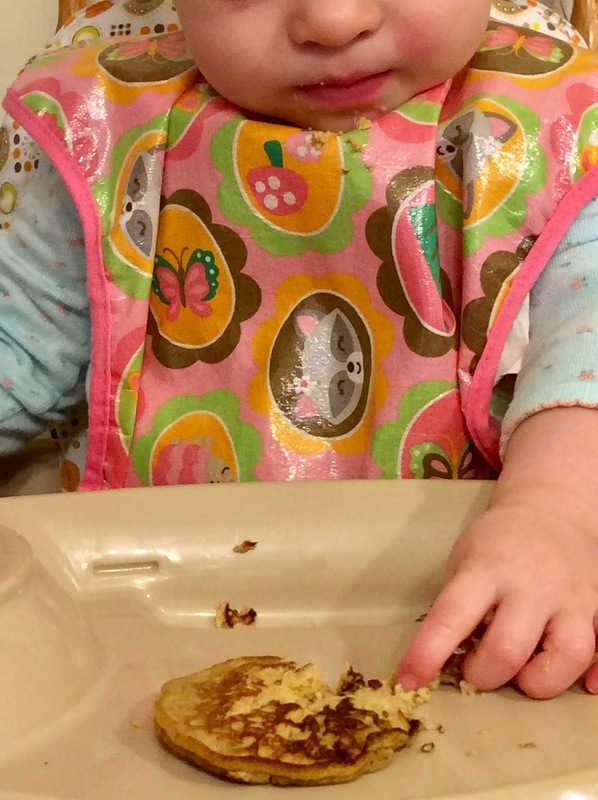 Around the web, banana egg "pancakes" are a very popular baby/toddler food. I always see moms recommending them in groups and such. I have no idea where they originated, but they are a great idea - easy, simple, and healthy. Plus they have a perfectly soft and spongy texture (they are not like a regular pancake) that make them easy for eating. The "recipe" is just mashing one ripe banana with a fork and then beating in an egg and cooking like pancakes. See - super easy! Our twins like them a lot. But, of course, I wanted to put a little spin on them and after finding one lone can of pumpkin in the pantry, I knew what to try. 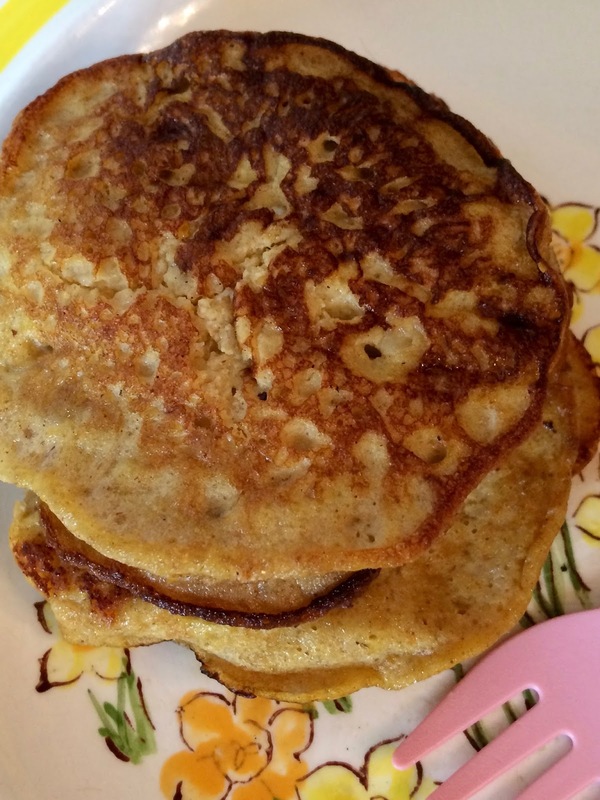 This recipe makes about 12 little "pancakes" (about 2 servings).